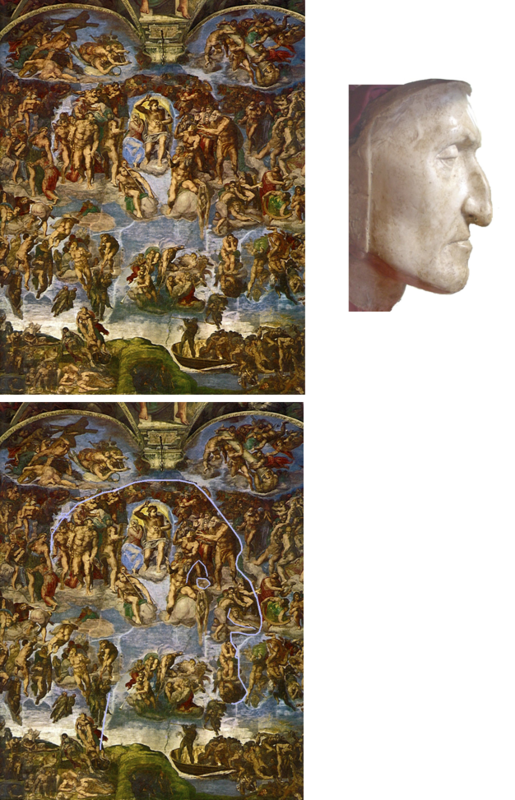 Compare the diagram (bottom) and Dante's life-mask (near left) with the Last Judgment (far left). If you cannot see Dante's profile even after you have enlarged the frame by clicking on it, click here instead and then return. 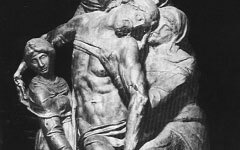 Once it is recognized that the figure of a resurrected Christ is positioned in the center of a poet's brain, Michelangelo's meaning is clear: Dante as the artist's alter ego is undergoing a moment of creative inspiration, imagining, perhaps, the very image we are looking at. Jonah’s large figure sits above the Last Judgment and would have been the first form the Pope recognized on entering the Chapel. Today tourists enter from the other end. 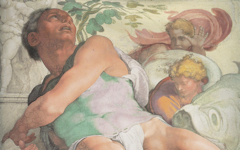 If the Pope understood art, he would have noticed that behind Jonah’s shoulder more pink cloth is shaped like an eye with a cornea in front and an optical nerve behind. The Cupid-like spiritello, is Michelangelo’s visualization of the nerves at work. 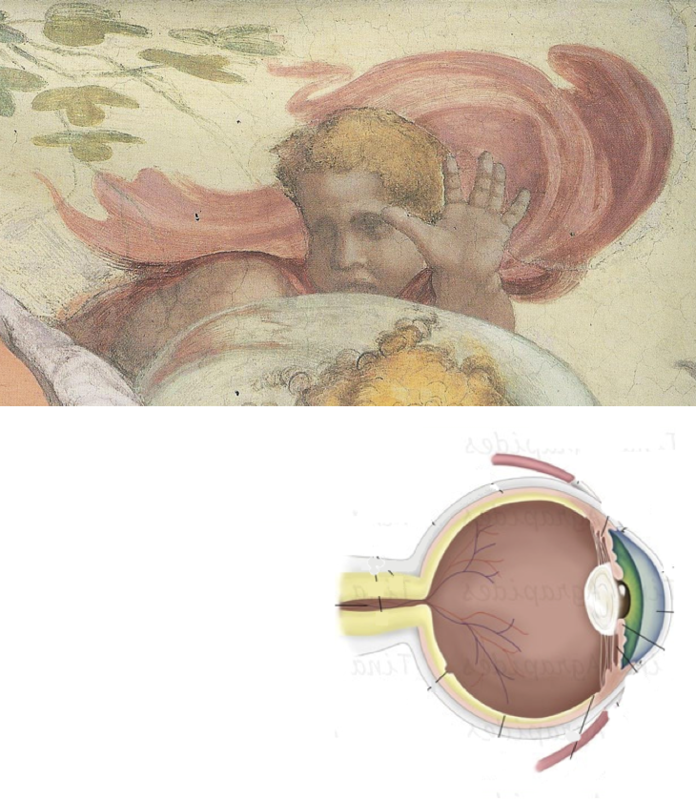 It was thought that little spirits ran throughout our body telling the muscles what to do.5 Here he holds his opened palm in front of the “optical system” to signal that both craft (hand) and vision (eye) are needed to create art. In another panel, God Creating the Plants (far left), the old man seems to float, his bottom exposed. Think, though, that you are on the floor looking up and you can imagine Michelangelo in the same position, sitting on a now-invisible stool or plank, painting the the ceiling. God is in the position Michelangelo once was, both in the act of creation. Jonah is similar (bottom). He, too, can be imagined in work clothes sitting on a plank, leaning back to get some paint. He is the artist, the most prominent figure in the whole room, painting the ceiling. Naturally, his attribute is the optical system combined with the spiritello's hand. 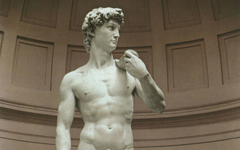 In the longer version of this article and you will learn how Michelangelo turned the entire chapel into a representation of his own mind and body because, as Christian mystics have ever claimed and pagan ones before them, we are God.6 The human body is a microcosm of the macrocosm where everything in heaven can find its counterpart inside us. That’s why Michelangelo and Leonardo cut up cadavers. They were not trying to draw muscles more accurately – to do that, you need to look from the outside – but to search for the secrets of the cosmos. Besides, there is no choice between heaven and hell when we die, only inside us while we live. Man, as Adam, was made in the image of God and in leaving “the Garden of Eden” our eyes were closed to divine reality and consigned to a form of blindness that takes material reality for truth. 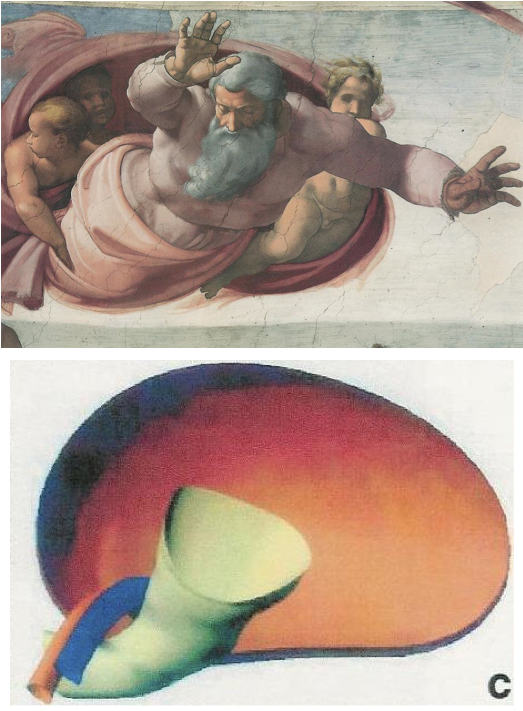 Michelangelo repeats this process in the Chapel where the vast majority of viewers can only see the action he painted on the surface, failing to recognize the visual illusions where the truth of his message can be found. Michelangelo's last Pieta, left unfinished at his death but intended for his tomb, helps us make sense of his more famous version carved when he was a young man. 2. 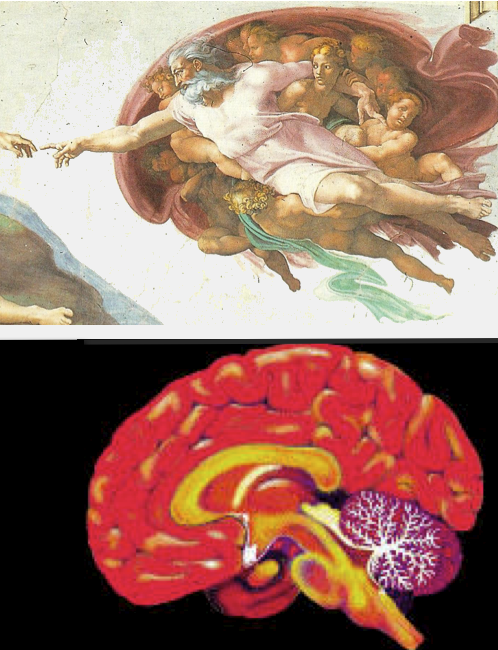 Frank Lynn Meshberger, “An interpretation of Michelangelo's Creation of Adam Based on Neuroanatomy”, Journal of the American Medical Association 264, 1990, pp.1837-1841. His discovery has been widely published in the popular press but still no art historian has cited it. Original Publication Date on EPPH: 16 Feb 2011. © Simon Abrahams. Articles on this site are the copyright of Simon Abrahams. To use copyrighted material in print or other media for purposes beyond 'fair use', you must obtain permission from the copyright owner. Websites may link to this page without permission (please do) but may not reproduce the material on their own site without crediting Simon Abrahams and EPPH.